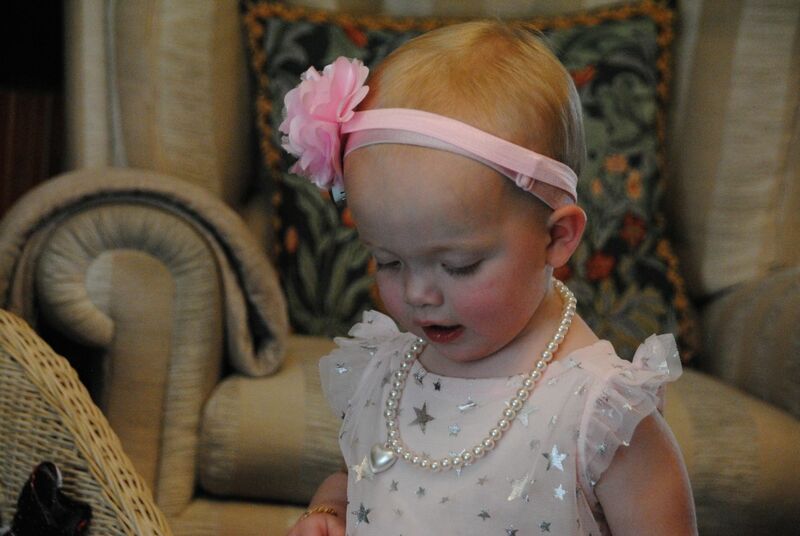 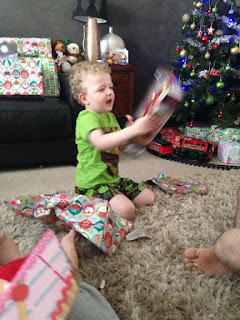 And then there was the fun in our house………. 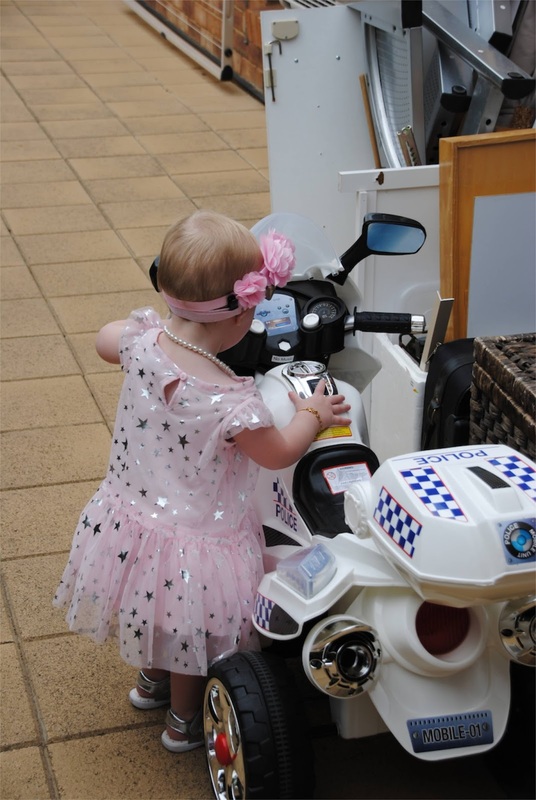 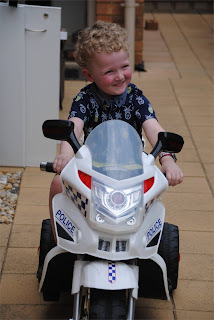 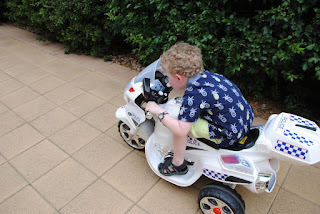 Brett had purchased this battery operated police bike for Beau some months back but it remained in the box unopened until we offered to buy it. 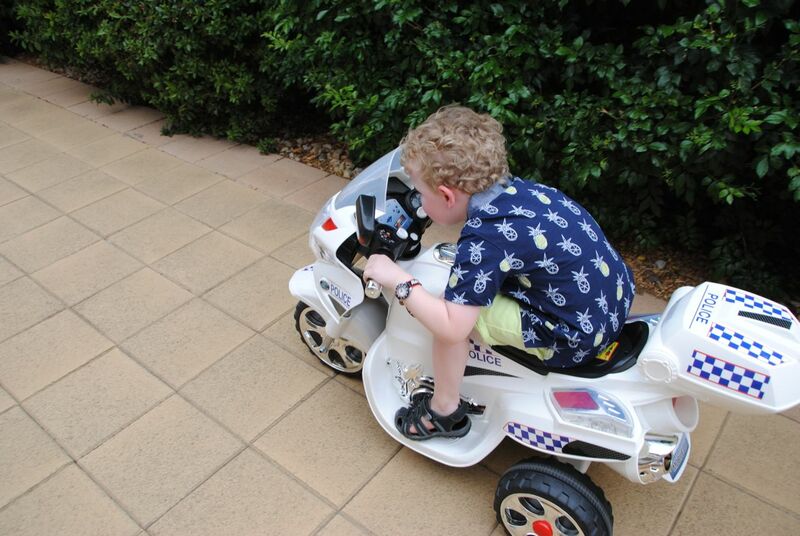 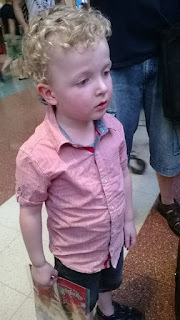 What a hoot seeing Beau lean forward like a natural - he must have been watching motorbike riders! 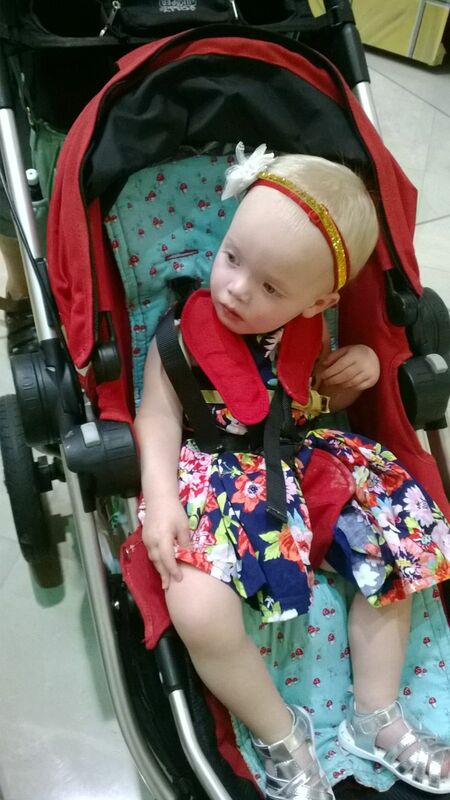 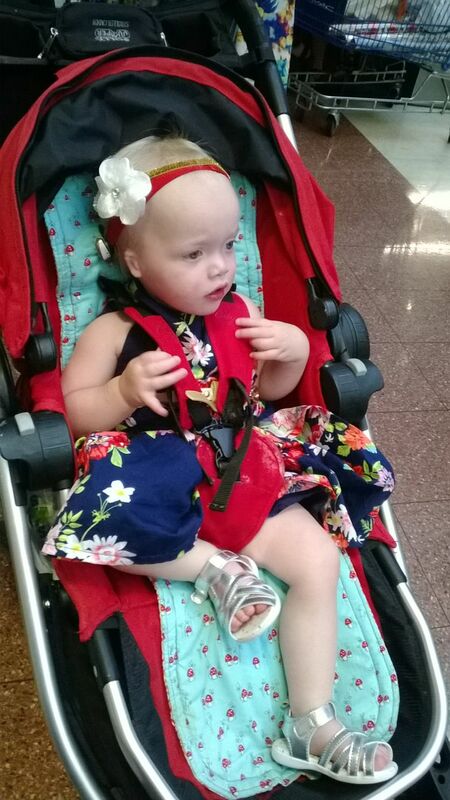 Maisie even thought she'd like a go……. Because of other family commitments it is hard to have everyone all together at once so we only had four of us and the two little ones for lunch……. (we never manage to get all of us in the photos though!)…….. 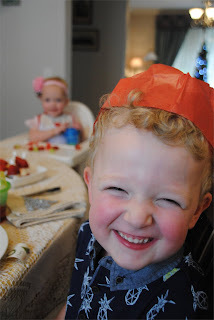 Tim and Sophie came for Christmas tea but sadly no photos of the rest of us. 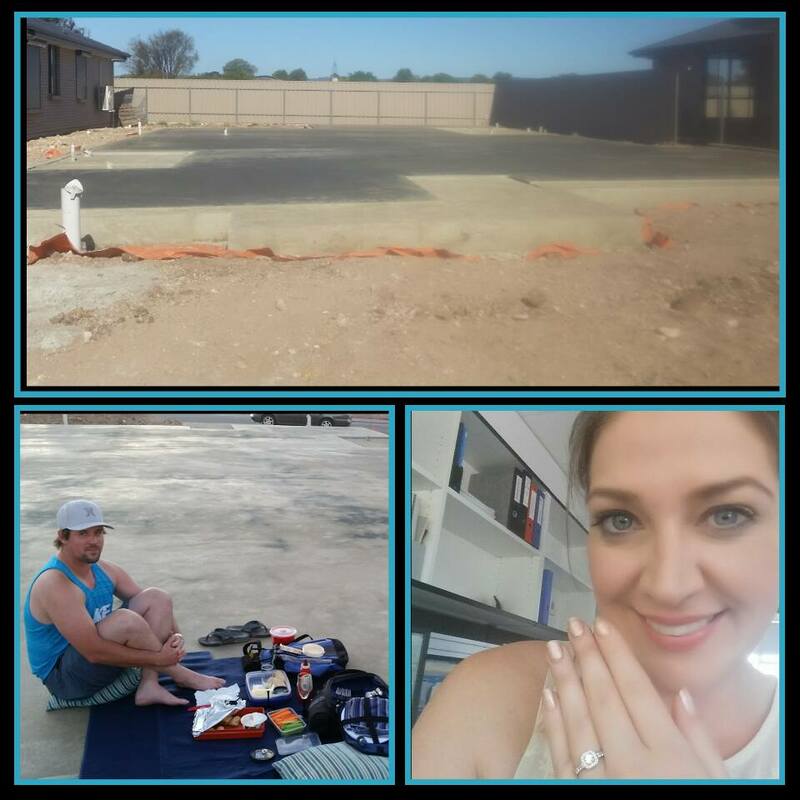 So instead I have pinched this from Sophie's Facebook page of the memory of the surprise marriage proposal picnic on their new home building site two days before Christmas!….. 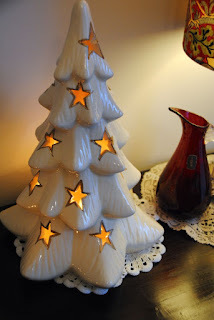 So as this year closes I would like to once again say thankyou to each and every one of you who visit the blog. 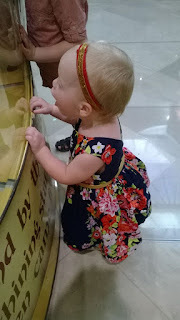 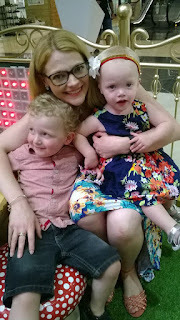 This last year has been much quieter for me with travel and teaching and for that I was thankful as there was a little childcare and new book planning to be done. 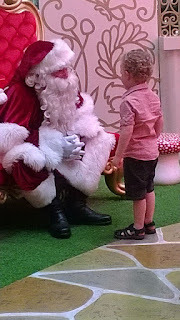 Next year seems to be a different story with teaching and travelling near and far. 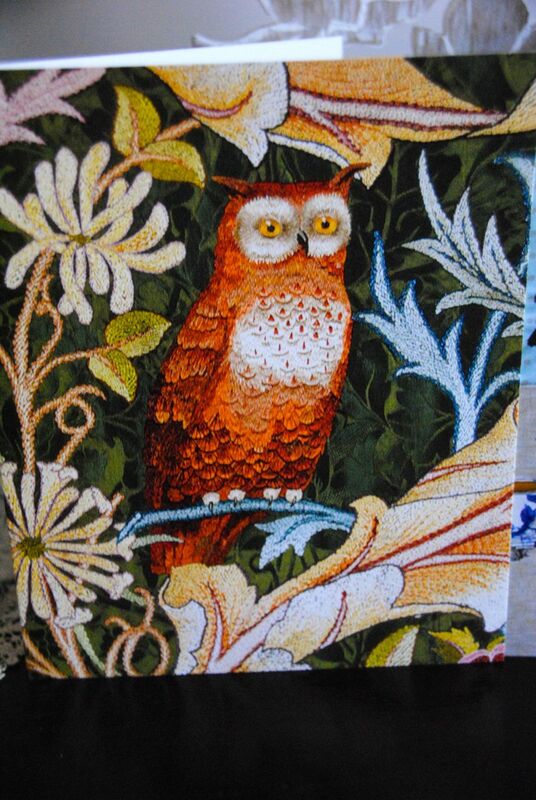 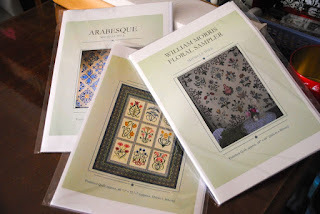 I am so looking forward to teaching in Norfolk Island, more teaching in New South Wales and Victoria but before that several gatherings including Bacchus Marsh, Peterborough and the Geltwood Quilt Festival. And of course the Whitecroft Tours in September and October. Not long after my return I am a guest at the Needlework Tool Collectors of Australia's biennial conference in Melbourne, so a busy year ahead……. 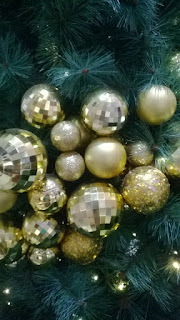 It is almost midnight on Christmas Eve and by the time I finish this post it will most probably be Christmas Day! 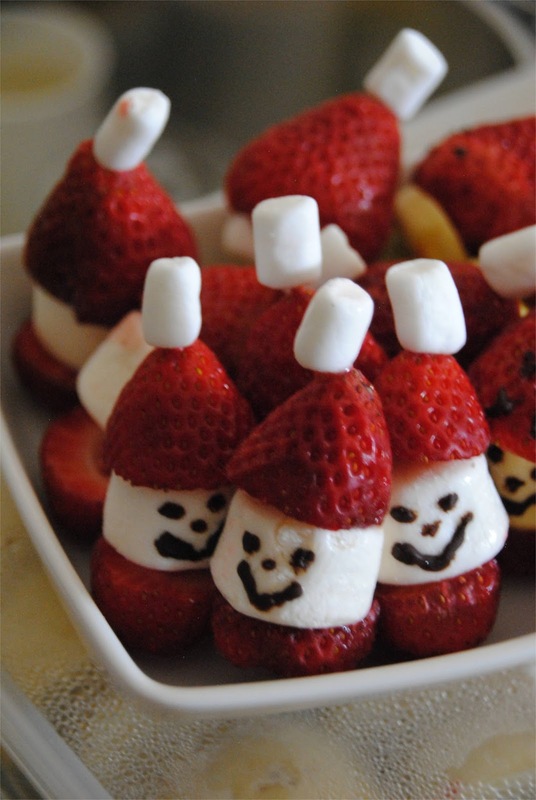 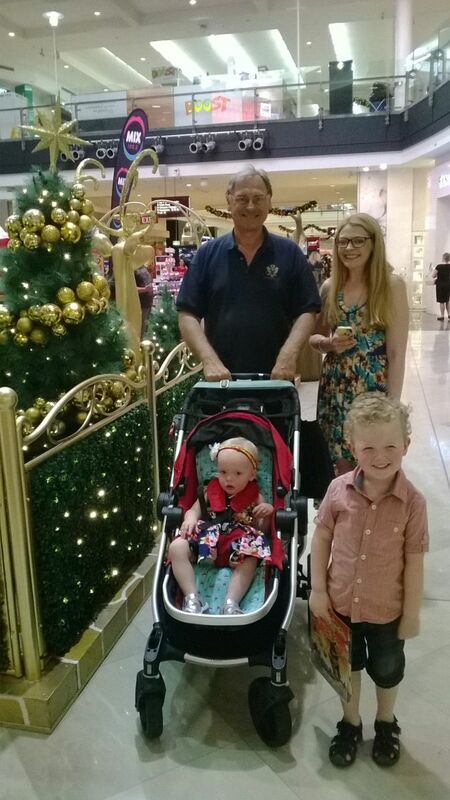 While Christmas is different for everybody for us it is family time and reminds us how blessed we all are. 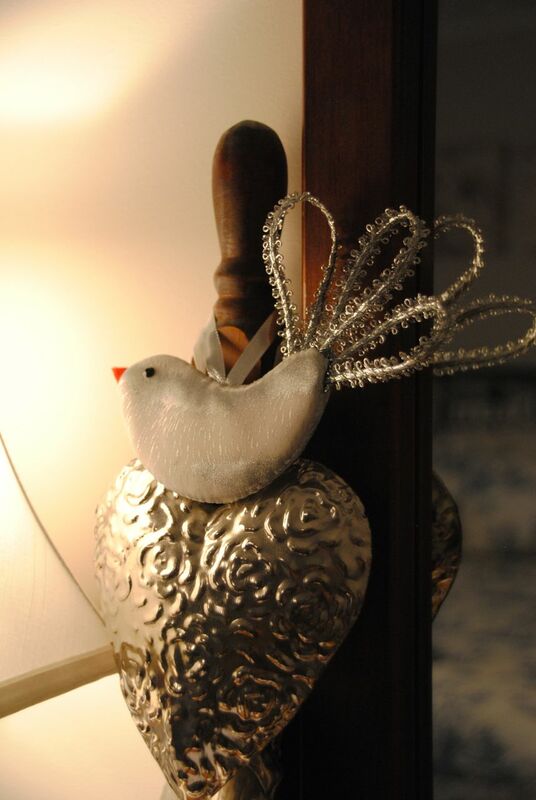 This special time also comes with sadness as we remember family and friends who are no longer with us. 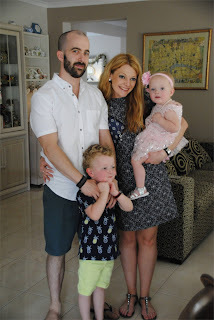 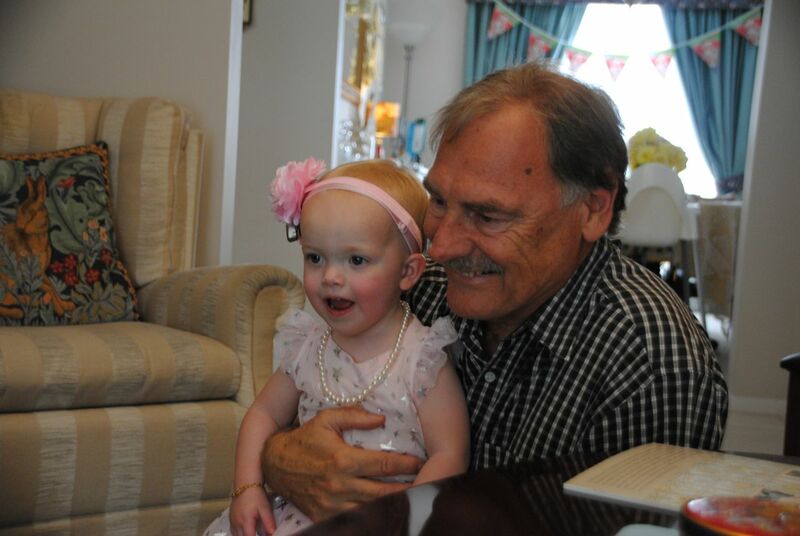 But this year will be extra special with the little people in our lives and yesterday the first wonderful gift we received was the news of our second daughter's engagement to Tim. Tim had been to visit Larry two days ago to ask his permission so we already knew about it. 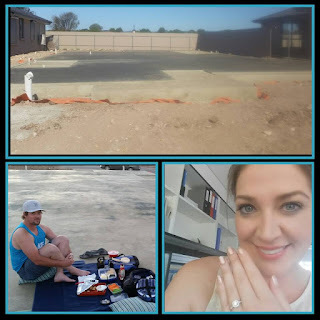 Last night Tim planned a surprise proposal with a picnic tea on their newly laid foundations for the new home they are building together - so very special and we are so happy for them both. 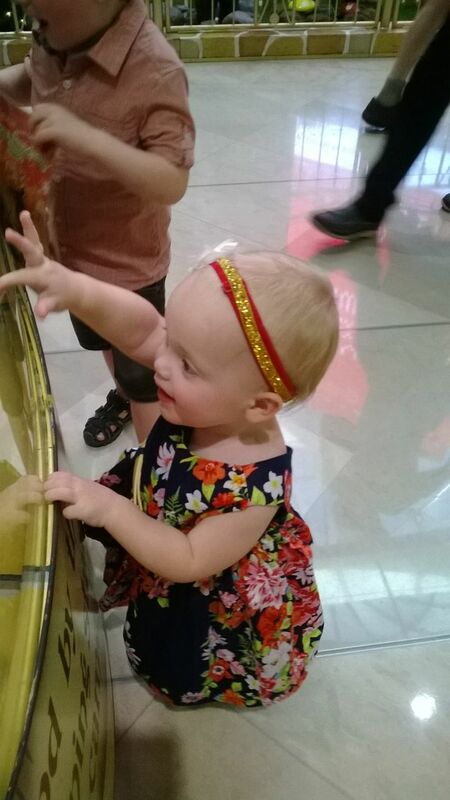 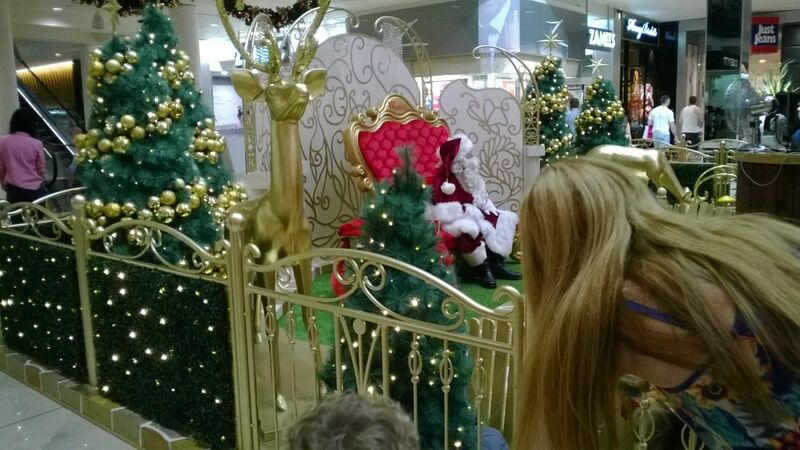 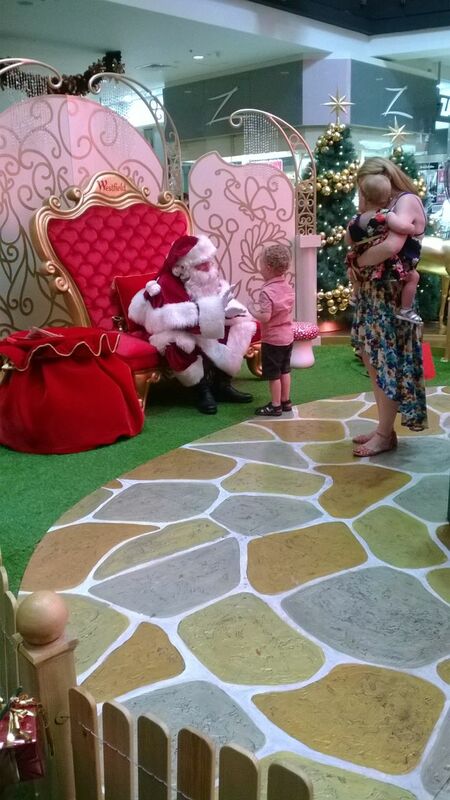 Yesterday Beau and Maisie also finally visited Father Christmas. 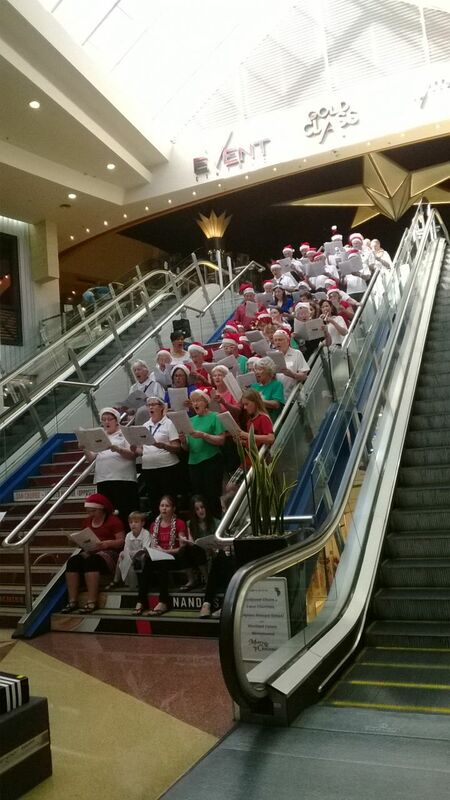 I didn't have my camera with me but the phone sufficed…….. 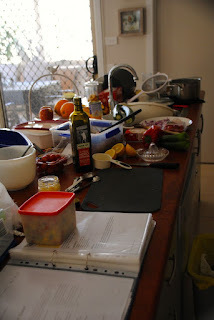 I spent most of today in the kitchen preparing for lunch and dinner with the family at home. Sadly it is going to be a very hot day (again! 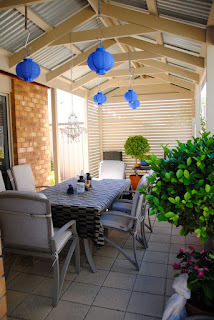 ), so our plans for dining outside have been changed. 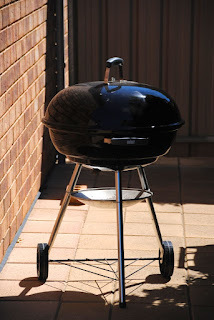 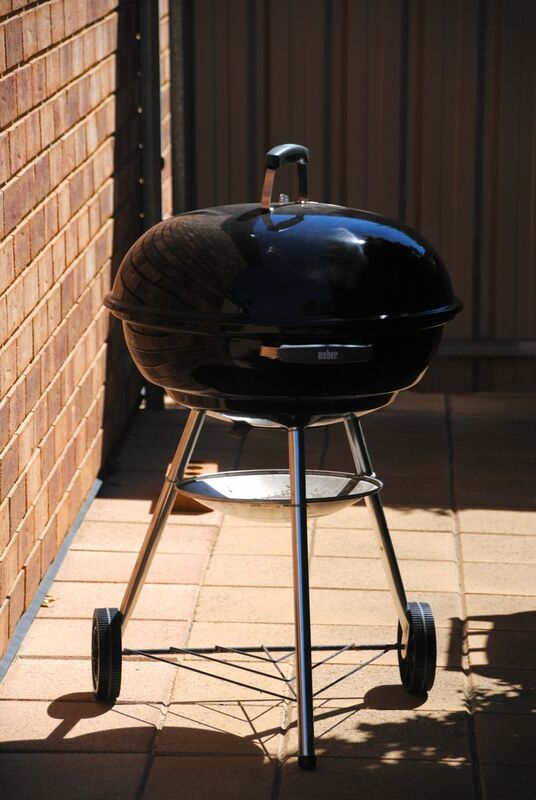 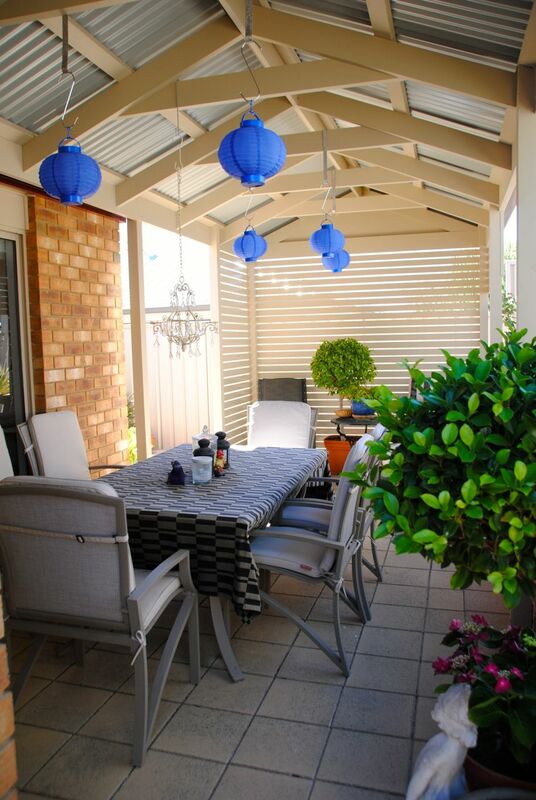 The Weber BBQ was sizzling with turkey and chicken and the veranda will just have to wait for a cool change………. 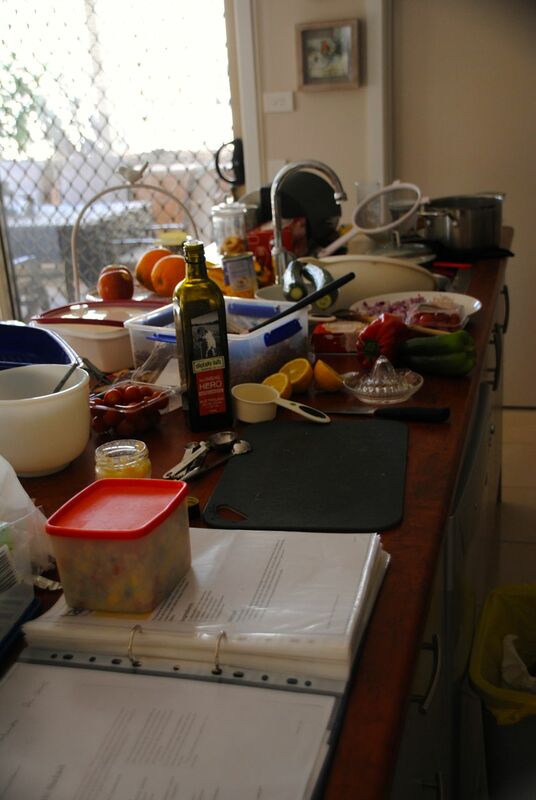 Times like this the kitchen just doesn't seem big enough! 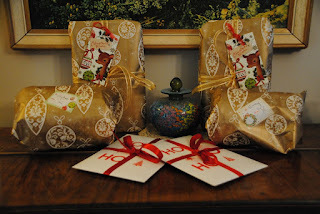 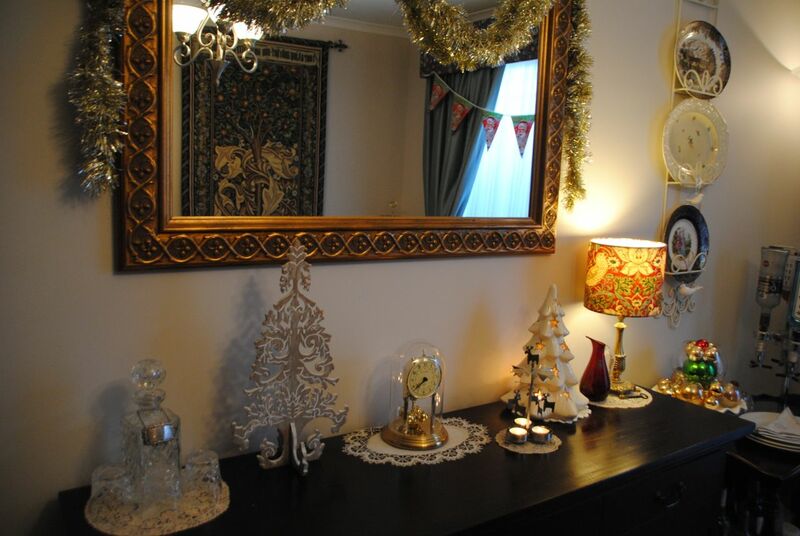 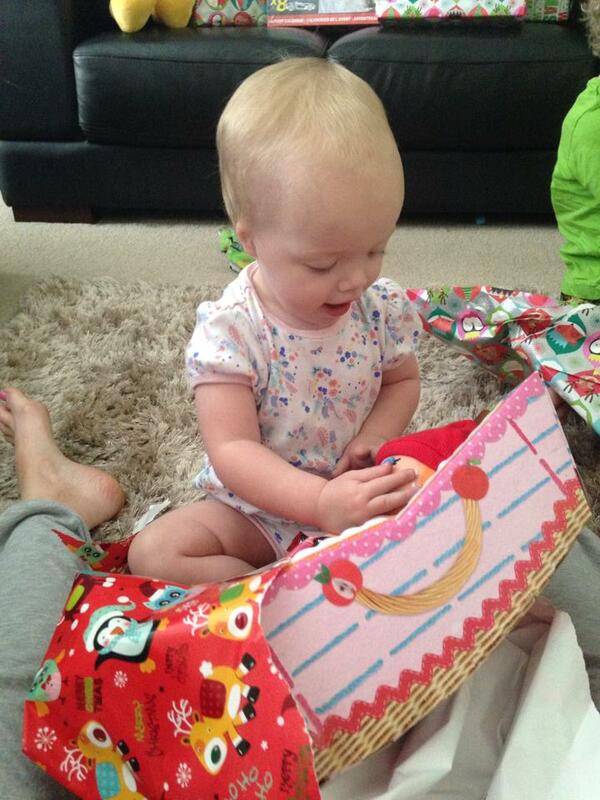 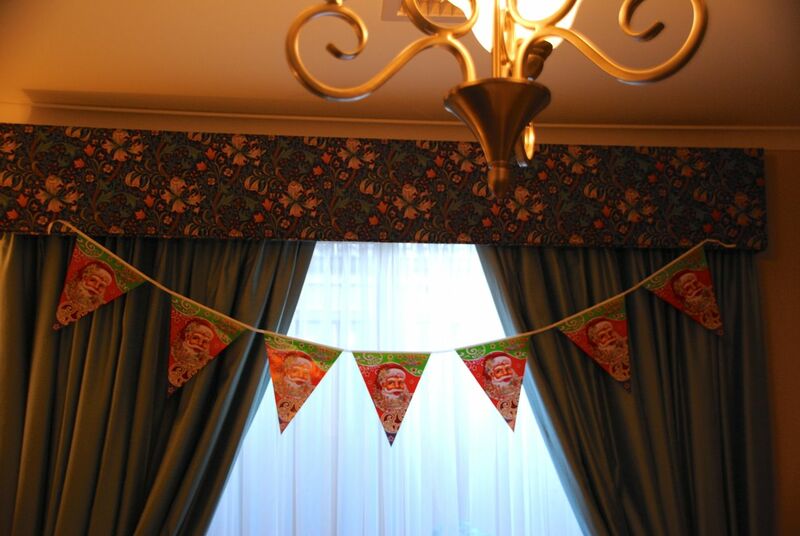 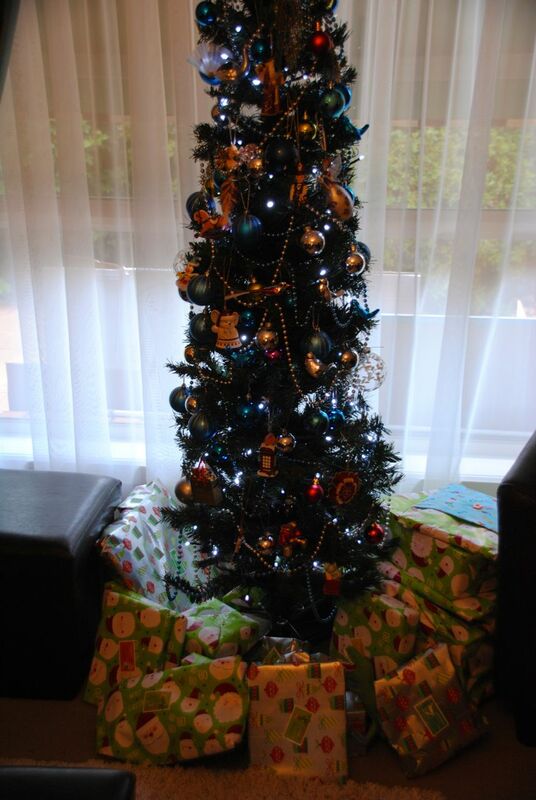 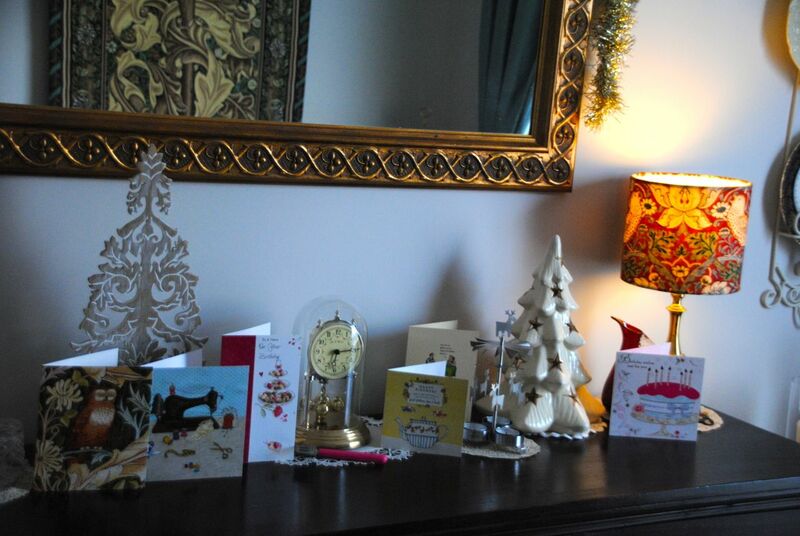 The big people's gifts are ready………..
and the little people's gifts have been under the tree all week. 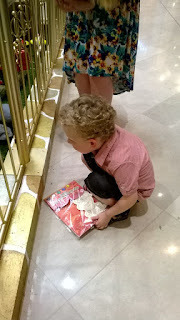 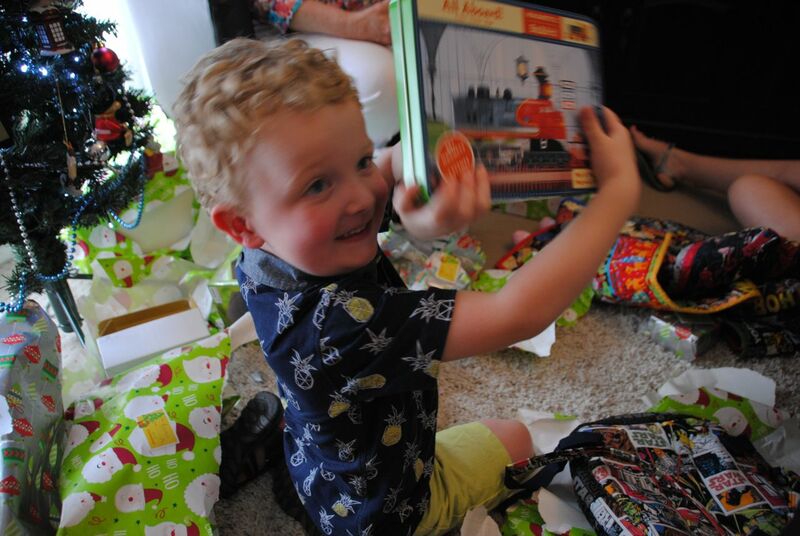 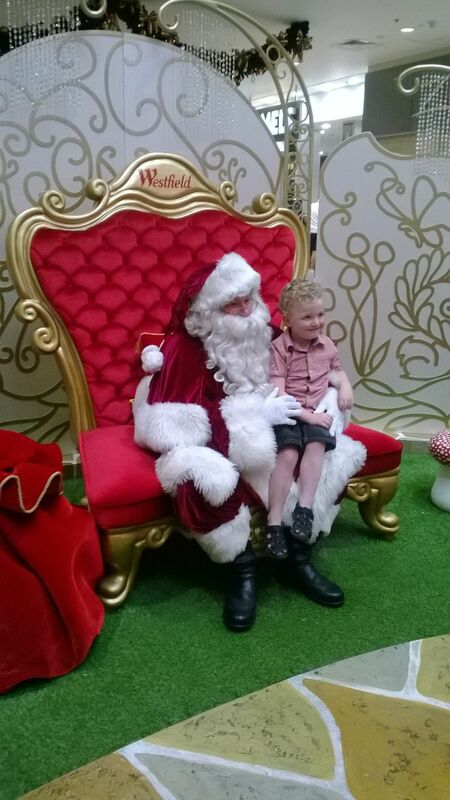 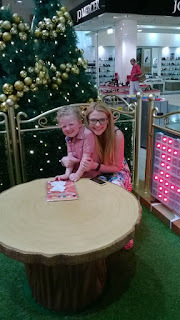 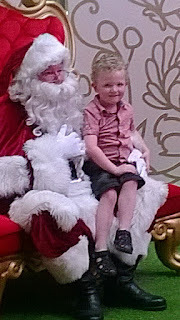 It was delightful to hear that during the week Beau had asked his Mum if he could visit Santa to ask permission to open the presents under the tree at Nanna and Poppa's! 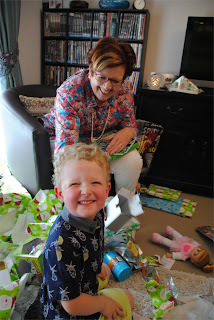 He is such a dear soul and we will certainly enjoy watching the unwrapping………. 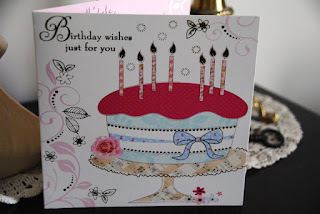 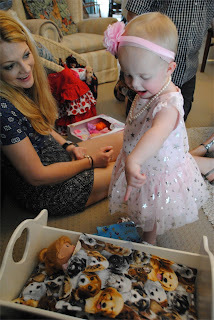 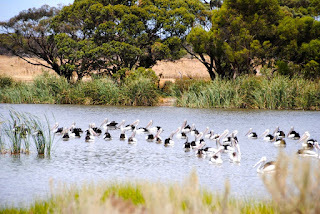 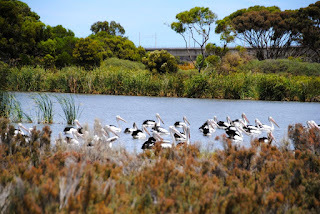 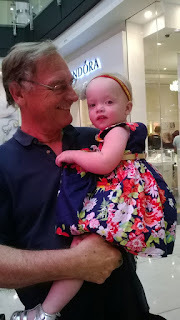 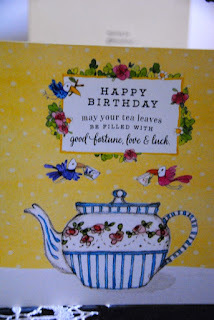 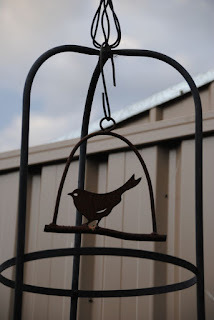 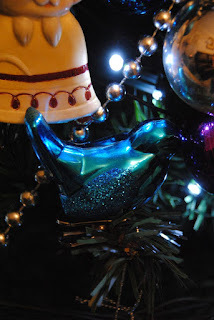 Birds, birthdays and blogging babble! 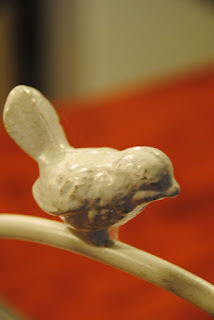 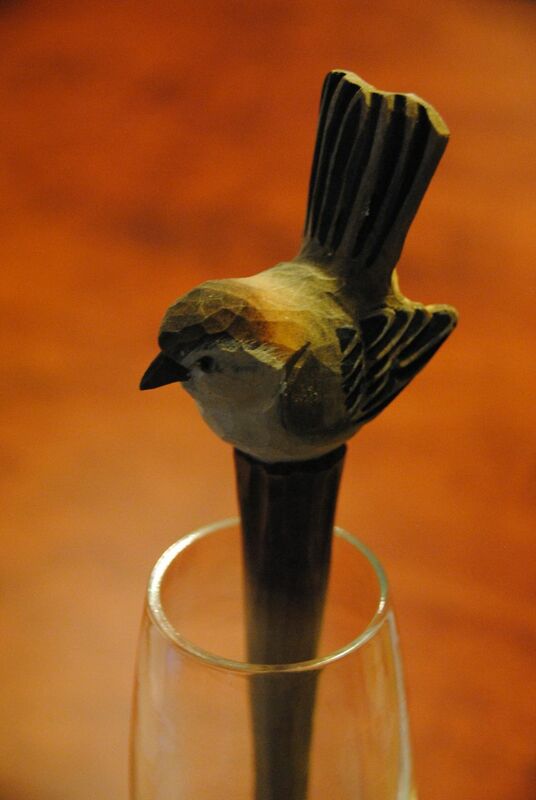 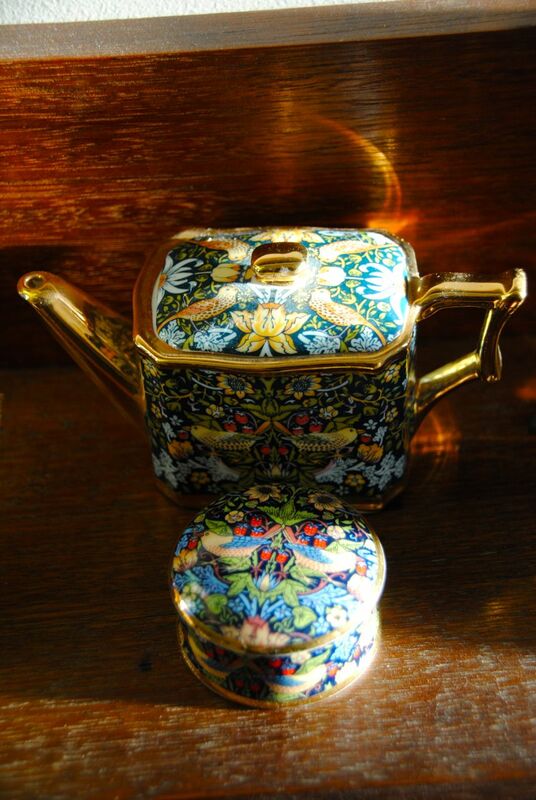 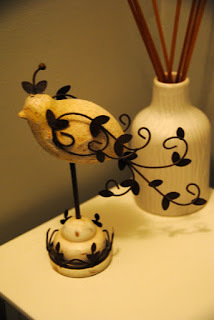 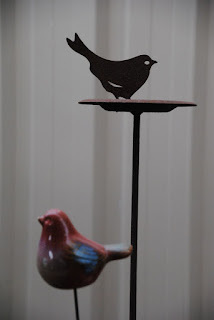 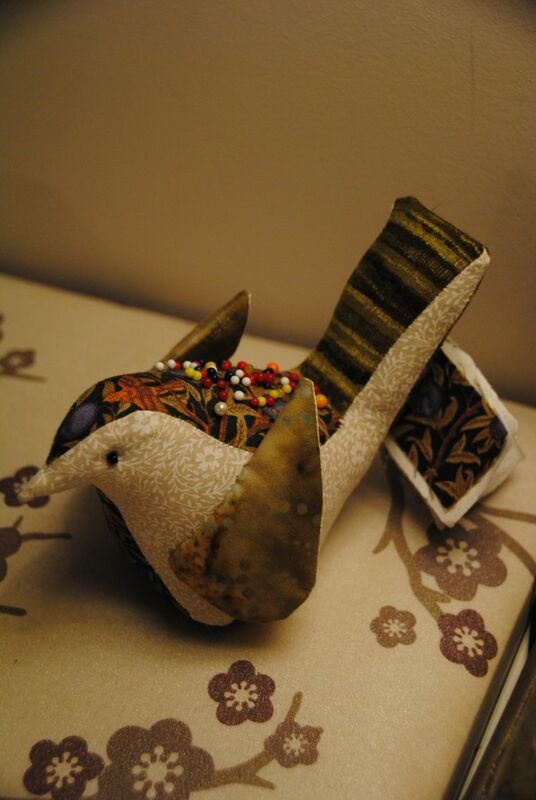 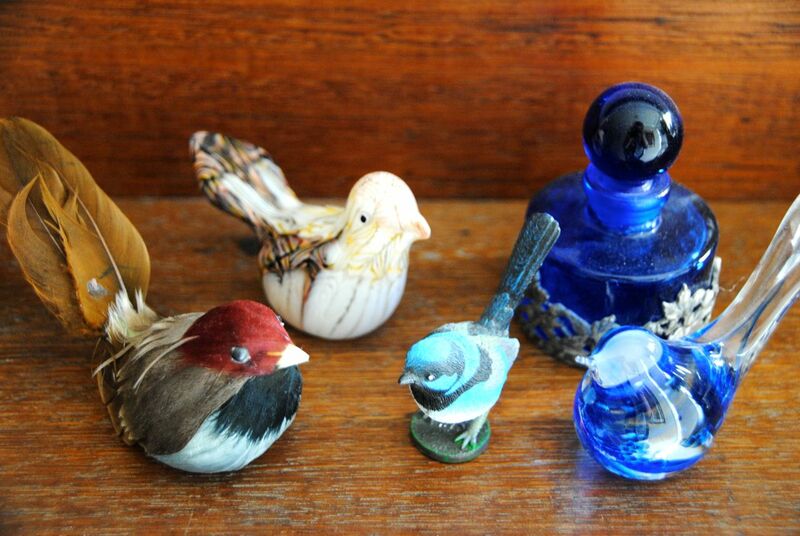 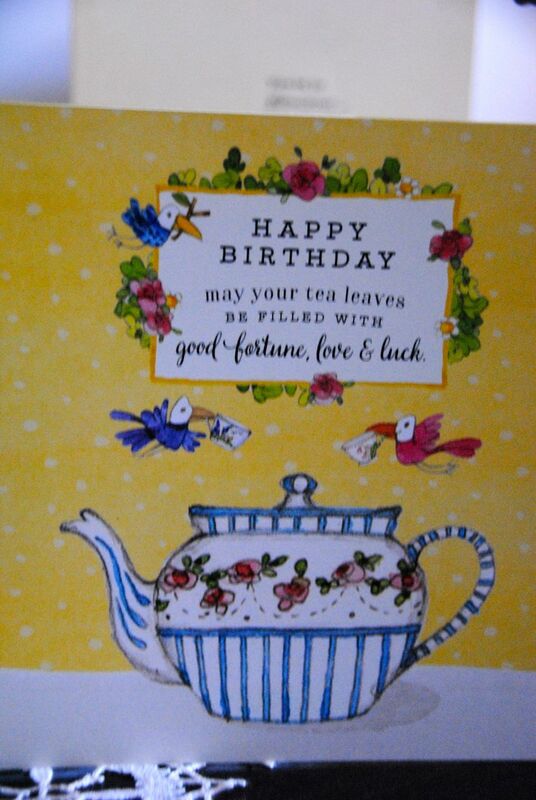 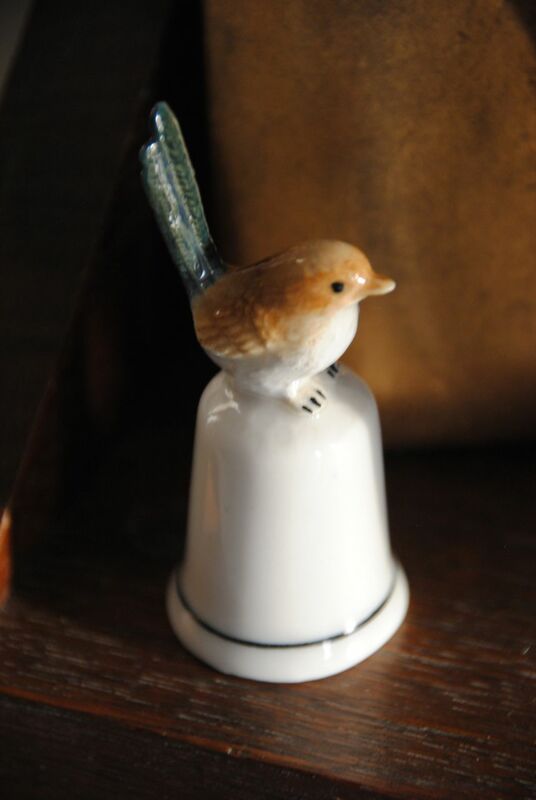 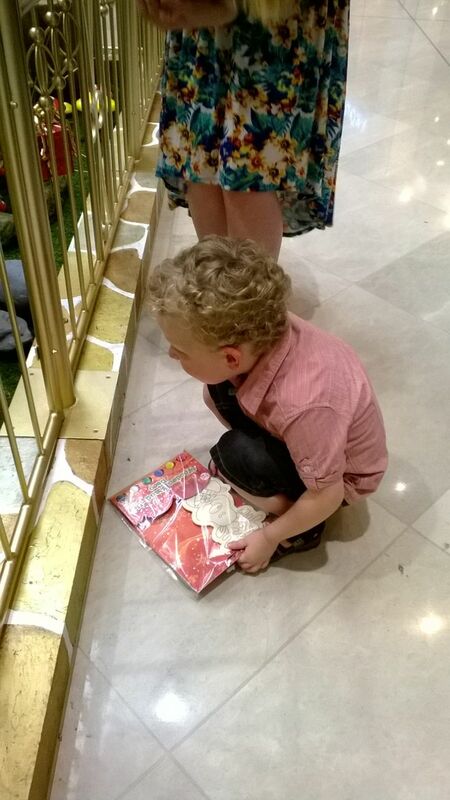 even a bird thimble and pin cushion…….. Being Christmas there are all the birds on the tree including some very old and fragile glass ones that belonged to my Mum………. 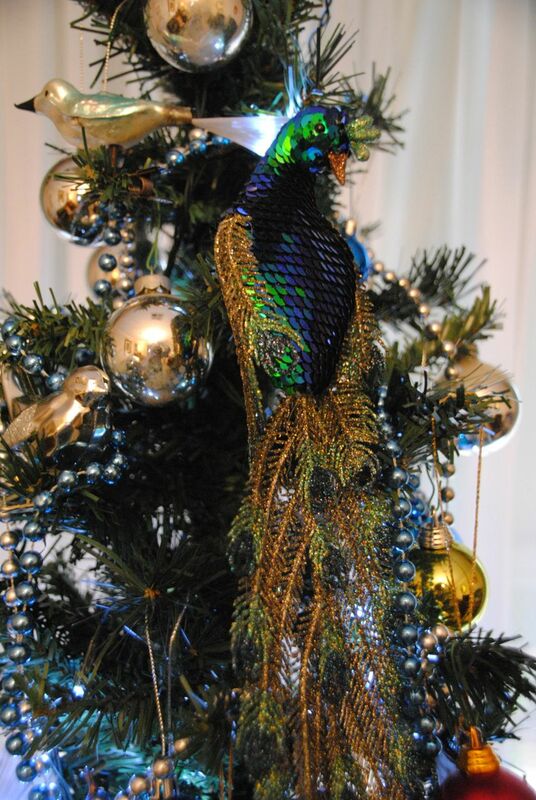 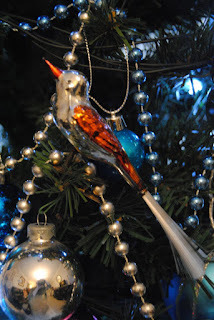 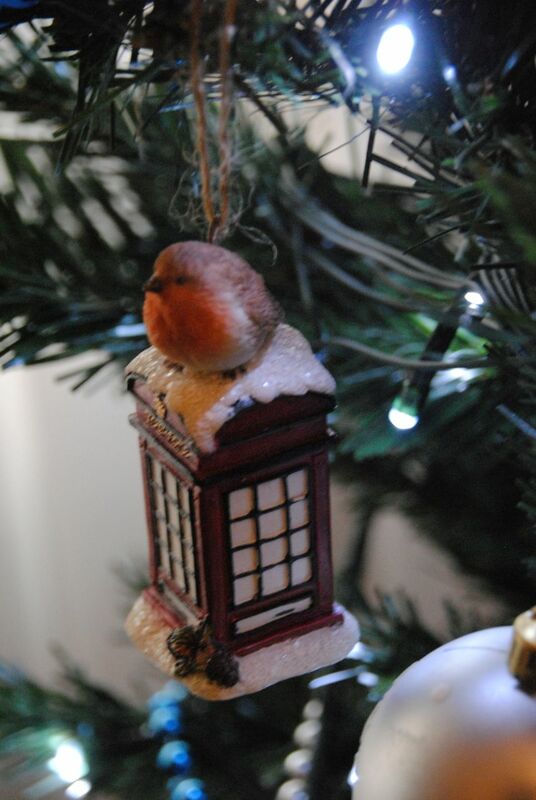 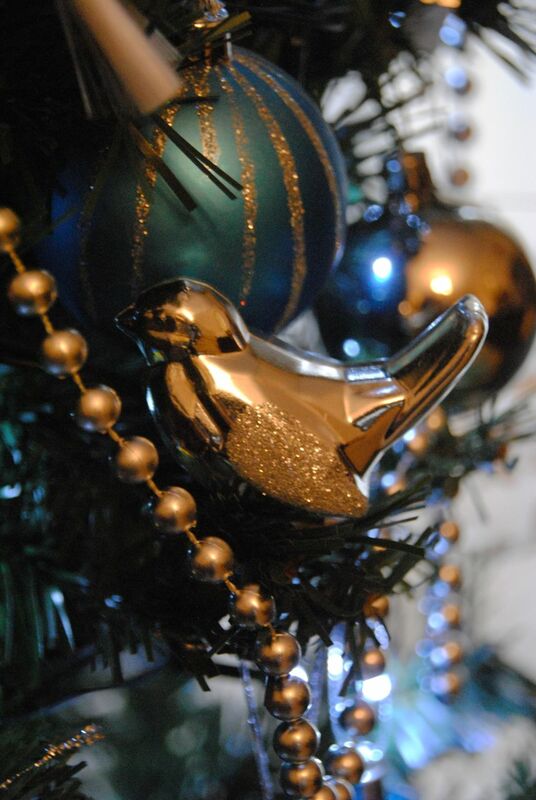 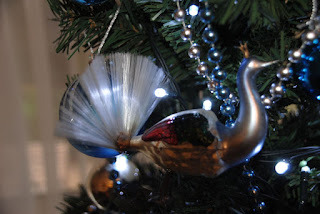 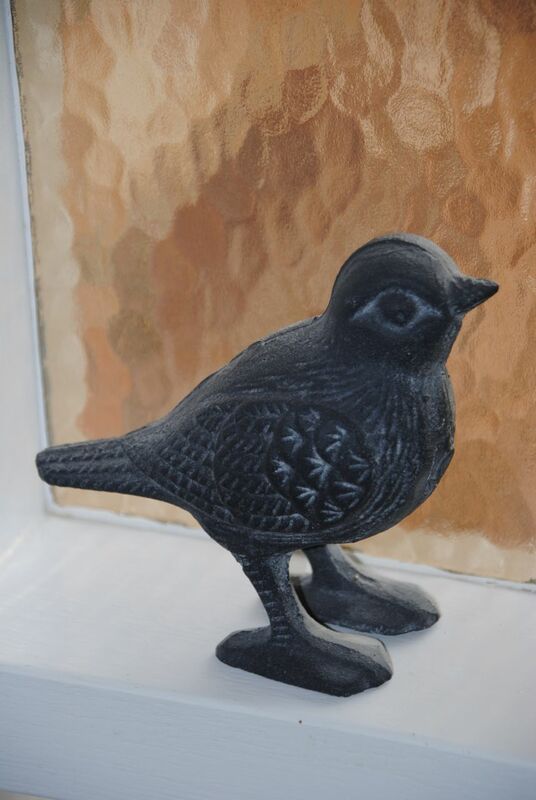 I have a robin purchased in Broadway in the Cotswolds and a resplendent peacock……….. 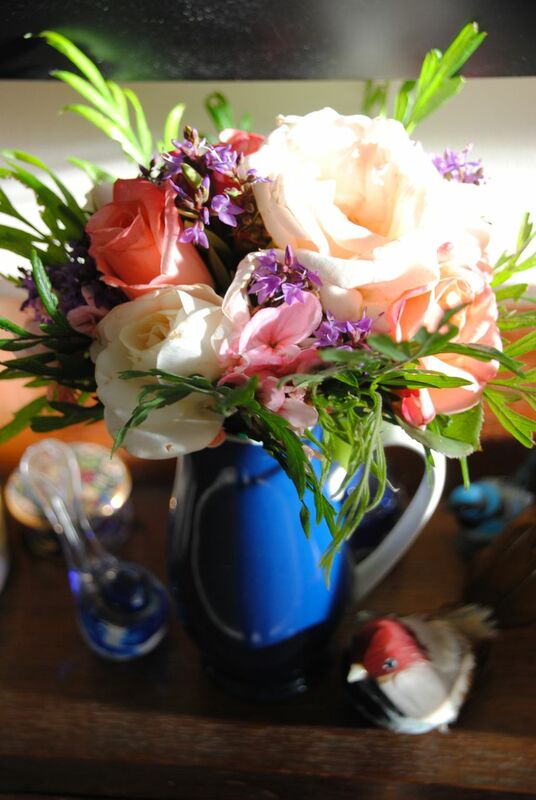 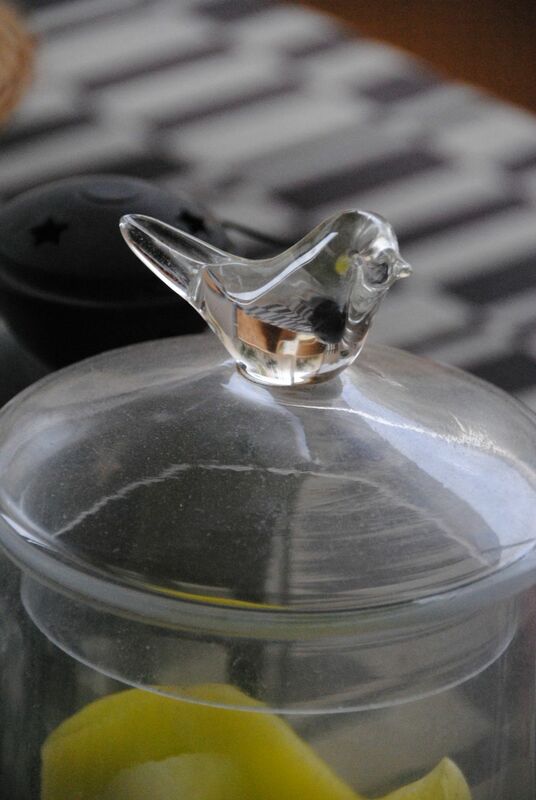 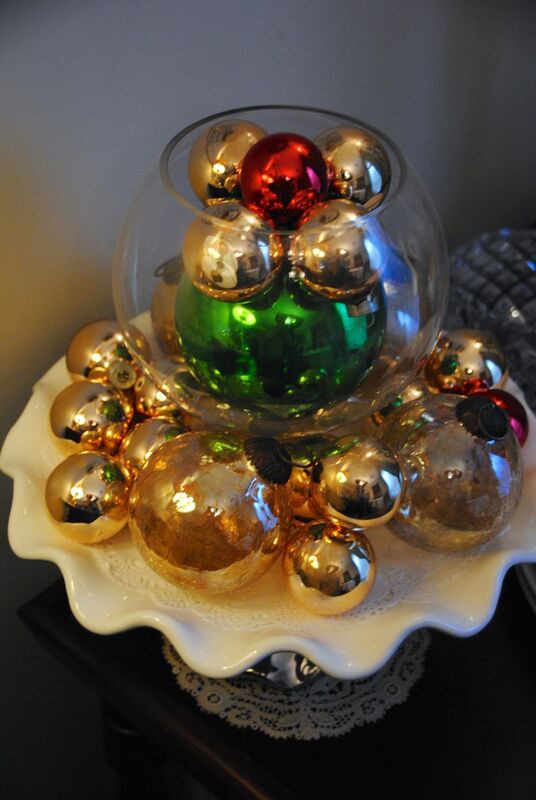 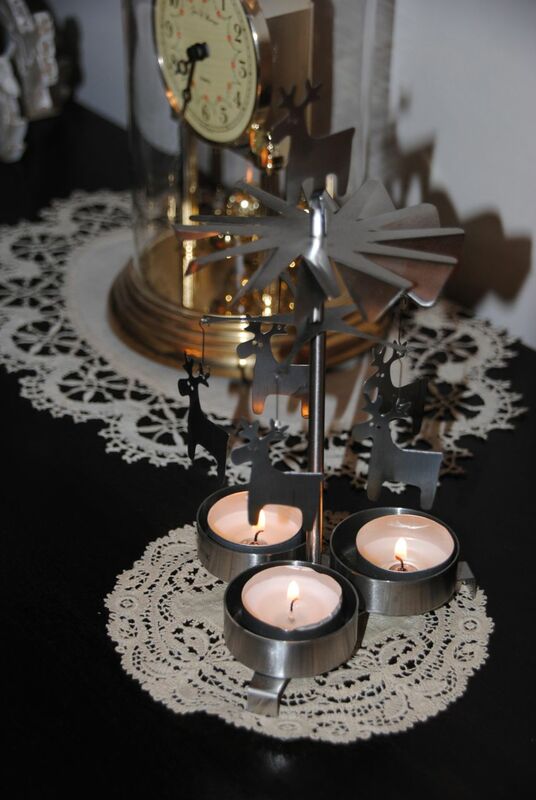 There is a bird on the candle jar and on top of the fruit bowl……..
Then outside in the garden….. 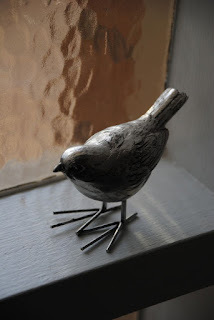 The little bird below left was one of several handmade Christmas gifts from a very special friend Kitty and hangs on my dressing table all year round. 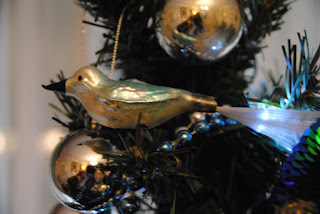 Every year Kitty makes us a new decoration - thank you Kitty for this years x Then there is all the bird jewellery - well some of it! 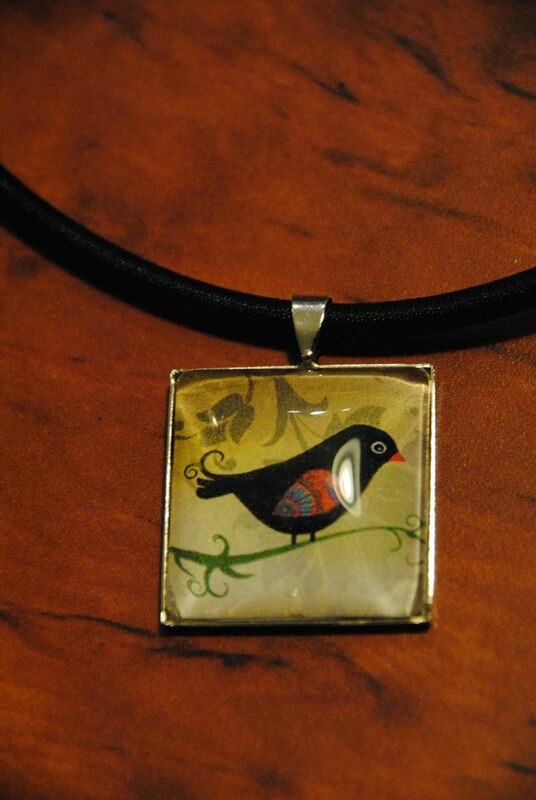 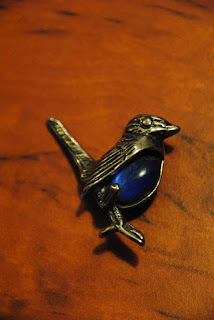 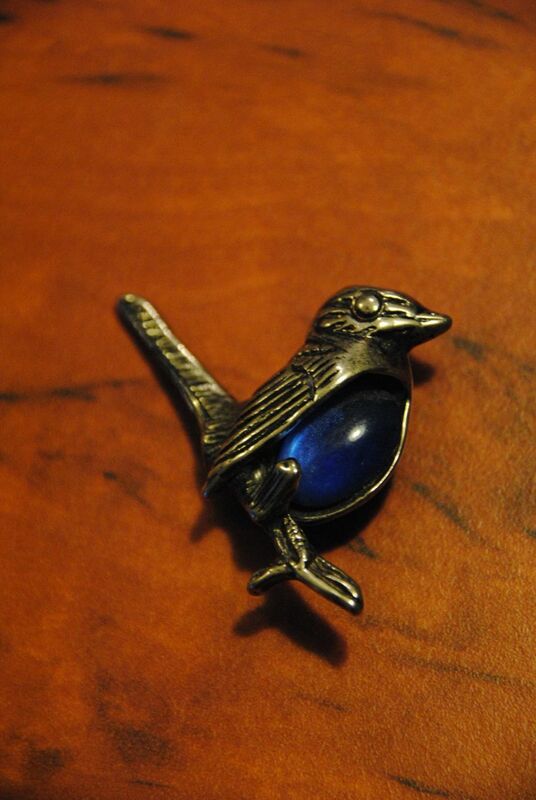 The little blue wren brooch was another gift from me to my Mum…….. 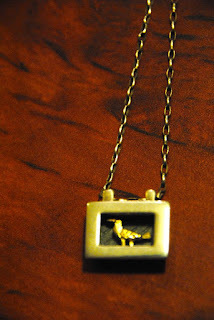 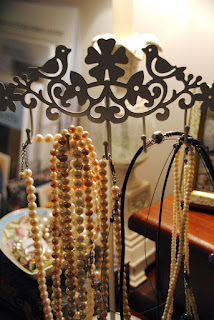 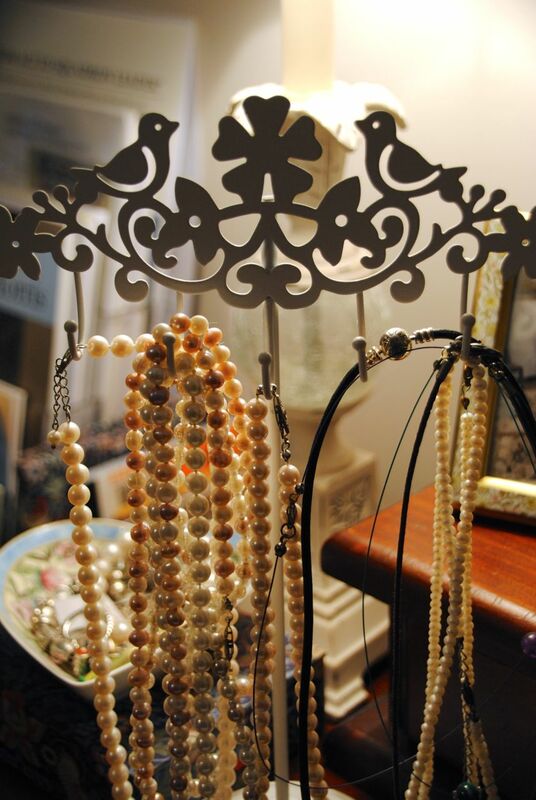 The little silver necklace was purchased in Ireland many years ago and the other bird lives in the loo! On Monday I also received an early birthday gift - this amazing hand stitched block holder from Kay. 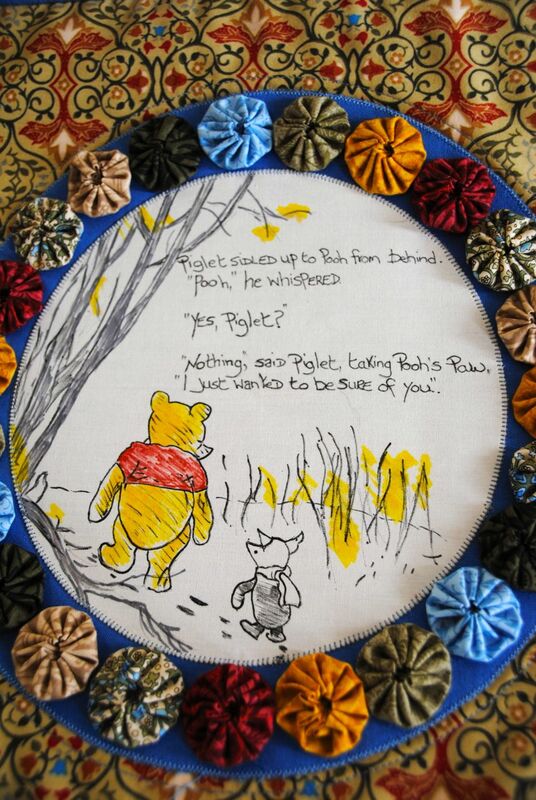 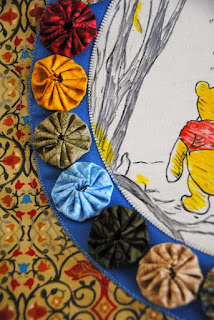 While her son Adam was going through gruelling cancer treatment I can recall sending her a couple of AA Milne quotes just to let her know she was in my thoughts…….. 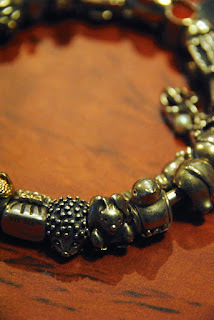 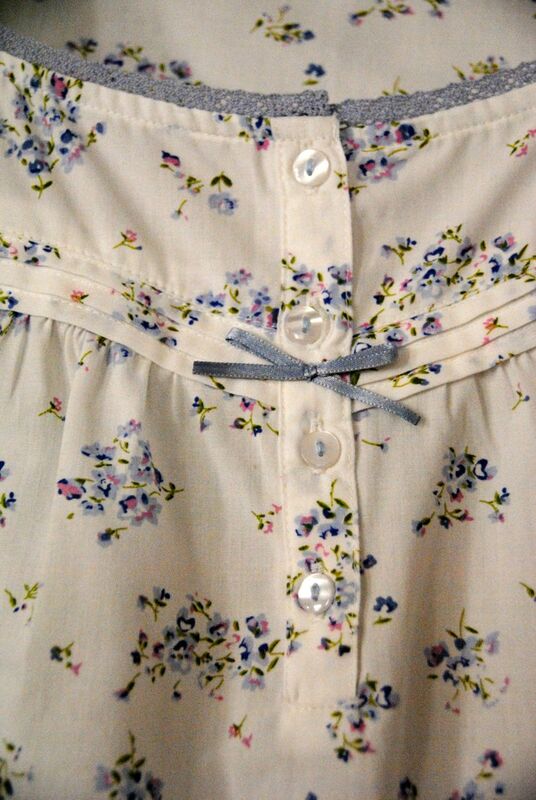 So here in the centre of this gorgeous piece she has included one of my favourites…….. 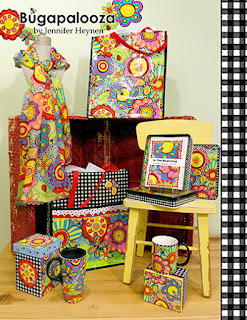 Speaking of In the Beginning fabrics I am thrilled to share that the gift range promotions are now on the internet which you can see here at In The Beginning Studio. 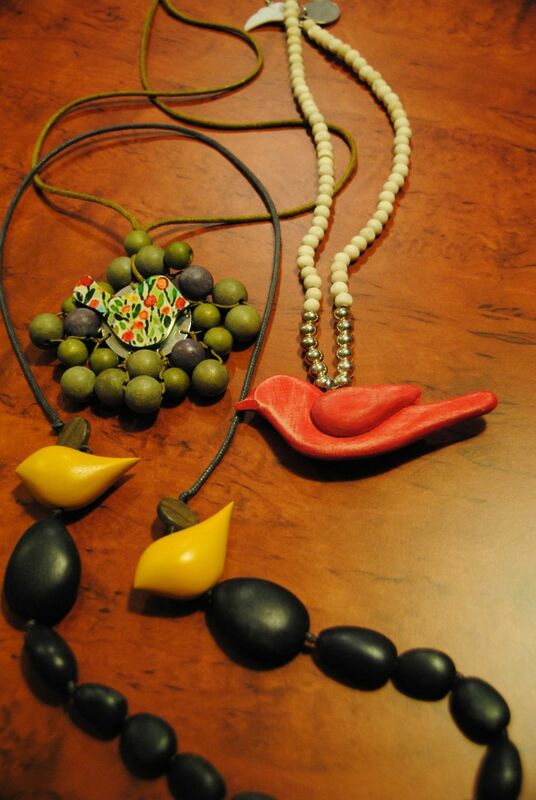 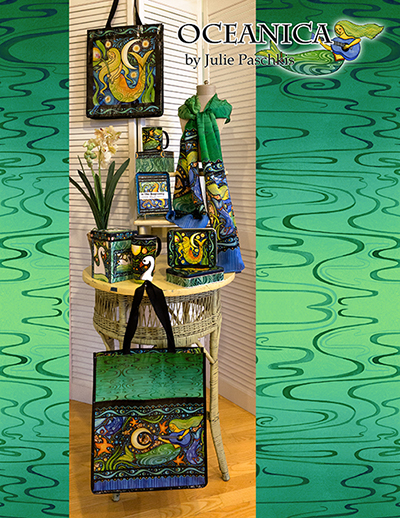 It is a great honour to be amongst such amazing talent like the artist Julie Pashkis……. 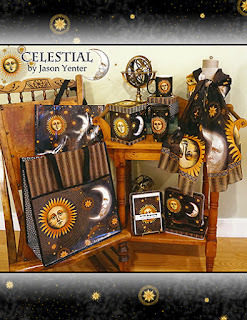 I met Jennifer Heynen on our visit to Houston in 2012 and her designs are as bright and bubbly as she is…….. So ask your local quilt shop to get stock if something tickles your fancy! More gifts arrived this week in the post…….a Christmas one from Heather of the Barossa Quilt Cottage but I've decided it was an early birthday present just because I can! 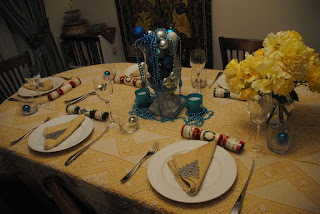 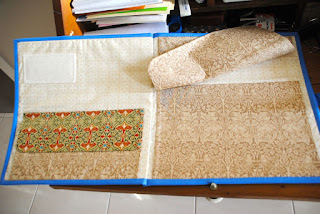 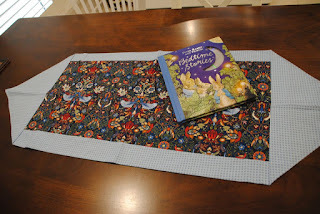 Thankyou so much Heather - the table runner uses more of my fabric collection so it was lovely to have a bit more of Morris and Miss Potter………. 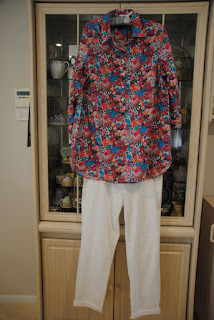 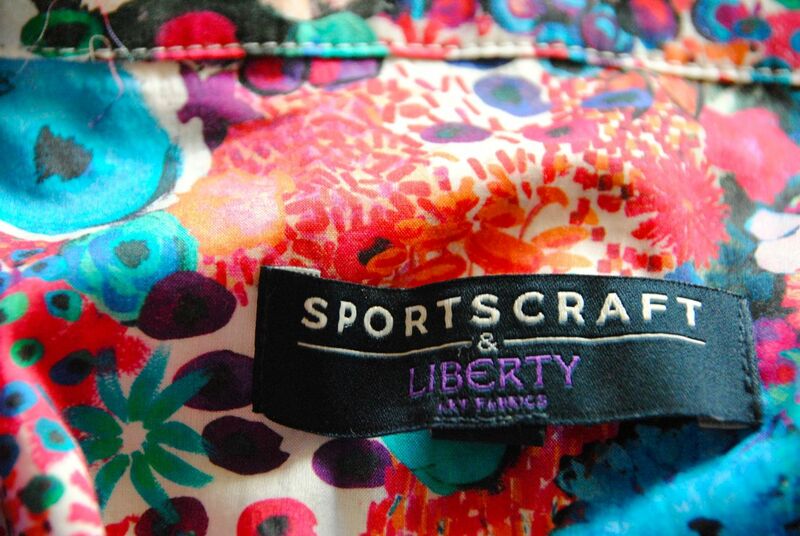 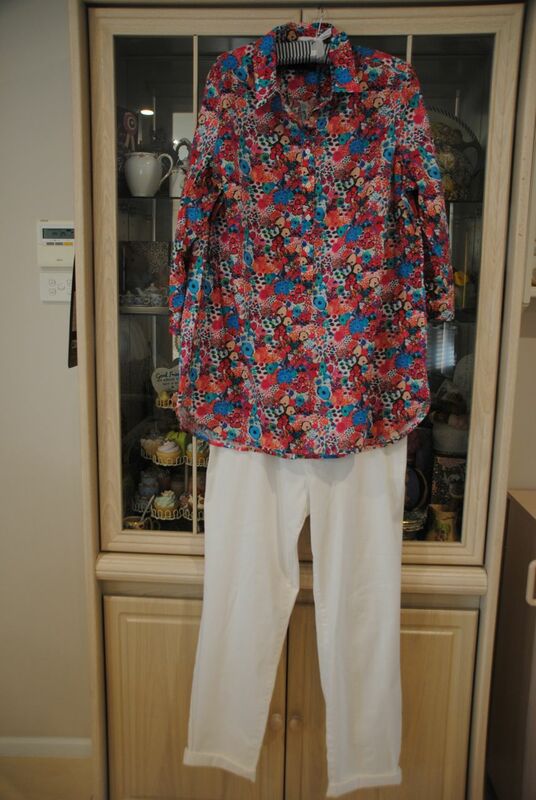 And the bargain of the year……..a Liberty shirt reduced from $150 to just $71 with some summery pants to go with them……….. 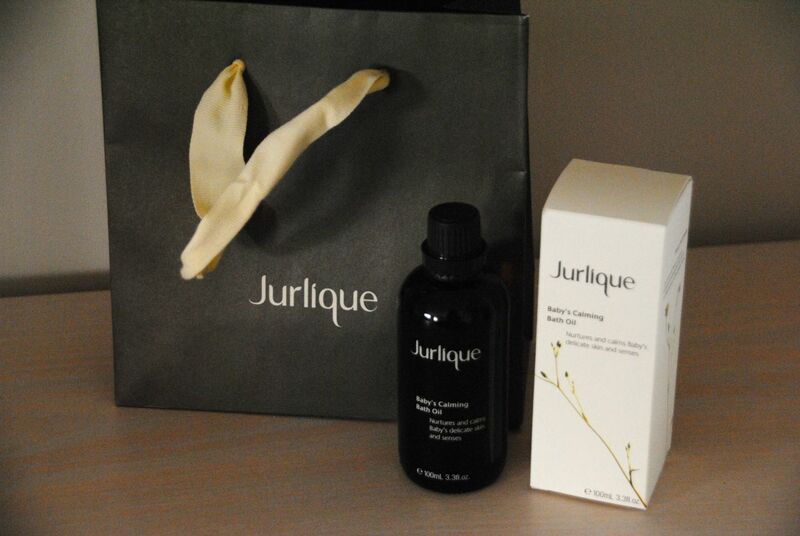 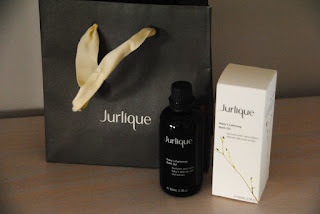 Some more heavenly Jurlique lavender bath oil that I use every night. This local company are now worldwide and it is wonderful that it all started here at home in the Adelaide Hills and all 100% natural too………. 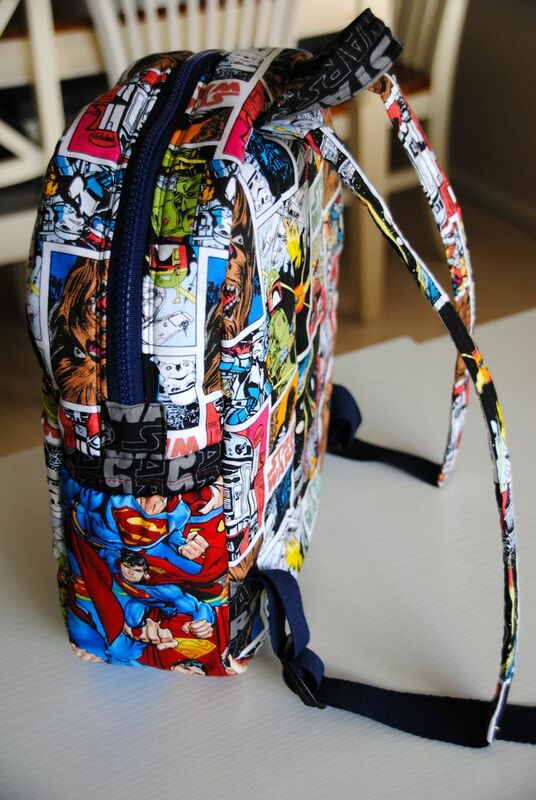 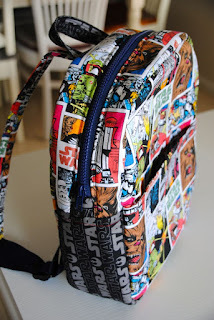 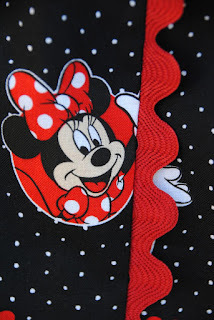 So the final B for the blogging babble is the Backpack! 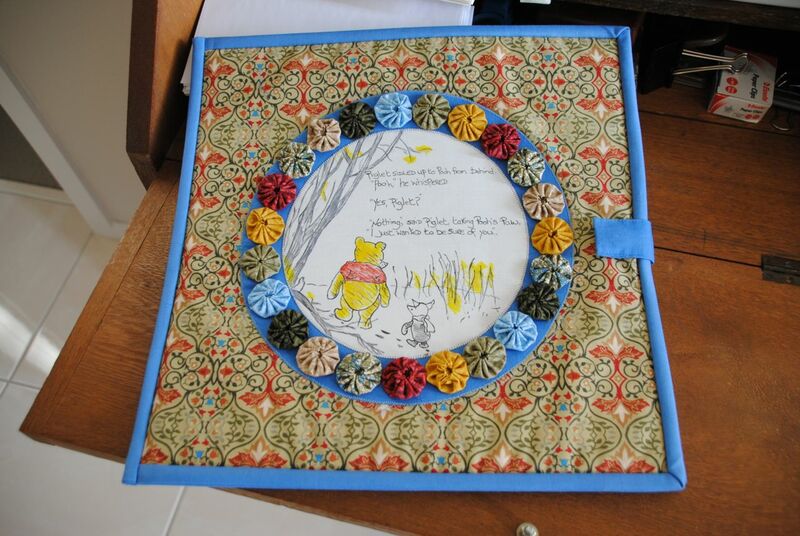 I've done some more stitching and made this for Beau who starts kindy next year. 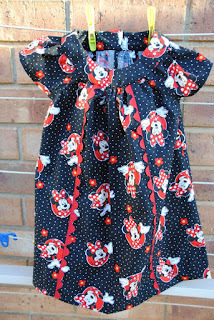 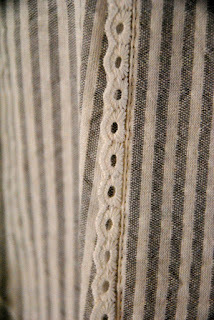 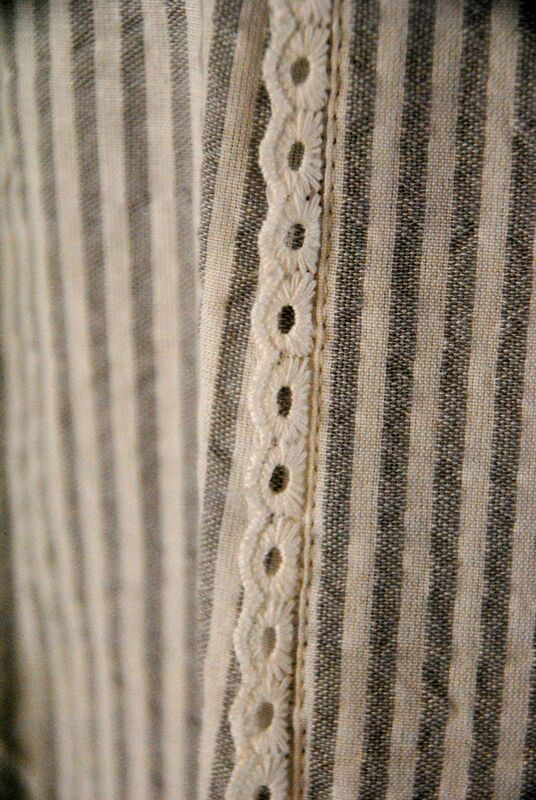 I think I might need to make myself one - maybe different fabric though! 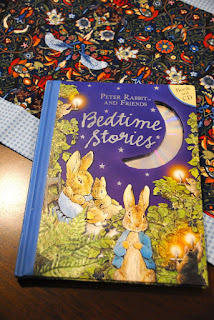 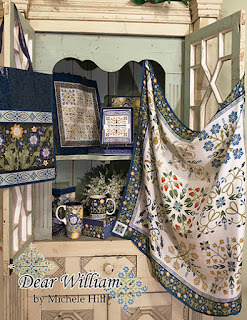 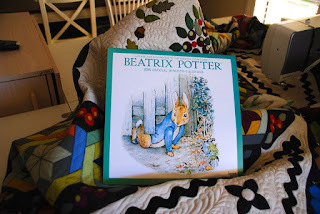 Why Beatrix Potter and William Morris?